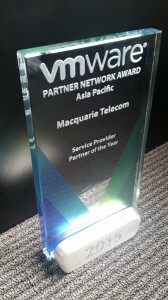 05 February 2015 – Macquarie Telecom’s Hosting division was awarded the 2015 Asia Pacific Service Provider Partner of the Year at the VMware Partner Network Award ceremony in San Francisco. The award acknowledges Macquarie Telecom’s ongoing commitment to enabling Australian businesses on their journey to the Cloud in the most seamless and efficient fashion; dating back to 2005 when they became one of the first formal VMware service providers in the Australian market. Macquarie Telecom recently became one of the first VMware Service Provider’s globally to take the company’s new NSX platform to market with its VMware based Launch Cloud Extender. Macquarie Telecom’s Hosting Group Executive, James Mystakidis, said Launch Cloud Extender is the result of a twelve-month joint venture that focussed on Software Defined Networking (SDN) and the implementation of a new Stretched Cluster technology. “We could see the benefits for network simplification for our customers and created solutions leveraging these technologies. We can now connect customers’ on premise infrastructure to our cloud offerings and multiple Macquarie Telecom data centres in a seamless and secure way, offering them real-time failover across WAN distances for mission-critical applications,” says Mystakidis. One such company who has benefited from this solution and the partnership between Macquarie Telecom and VMware is Micronet Systems Australia, who recently shifted from a private cloud infrastructure to Launch Cloud Extender. Mystakidis added that the Macquarie Telecom Hosting team is elated to have been named the 2015 VMware Service Provider Partner of the Year for Asia Pacific. “The award is a testament to our dedication to delivering the best cloud based solutions, outstanding customer service, and the expertise of the team when executing these solutions. We’re looking forward to continuing to work with VMware to take capabilities to market that strengthen our already flourishing relationship,“ says Mystakidis. VMware Spokesperson, John Donovan, Director Channels and General Business, VMware Australia & New Zealand, said the awards are a great way to recognise partner achievements and highlight the importance of consistently providing outstanding customer service. Macquarie Hosting would like to thank all of their customers for the continual support, without them we would not have been able to achieve this award. 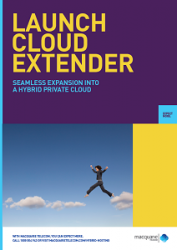 Download our Launch Cloud Extender Brochure today!